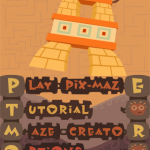 Budcat and Activision have teamed up to bring you Pix Maze. 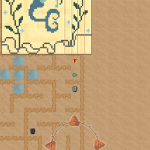 The object of this game is to complete different mazes and as you go a picture is revealed. There are small mazes, medium mazes and large mazes for you to concour. 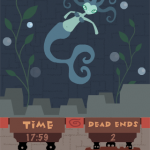 With over seventy mazes for you to complete this game offers a lot of play time. 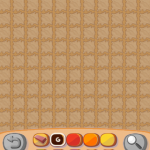 When you start up a maze your character is a bug that goes through the maze stepping on little color blocks that leave said color behind you to create the picture. 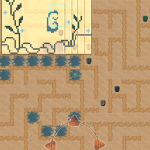 In the top left corner there is a screen that shows your progress on the picture so the further into the maze you get the more detailed your picture becomes. The controls are really simple and not intrusive. In the bottom right corner there are four arrows that you push to go in the direction you wish. 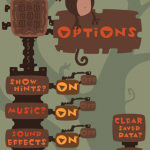 In the options you can set hints to be on or off. If you have the hints on and you wait at a fork in the road the right way will be show to you as a blinking color tab and if you wait even longer or find yourself off the main path arrows will show up to lead you back. You can also set a playlist of songs to play from the option menu. 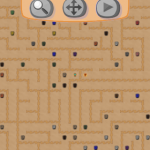 If this wasnt enough there is a custom maze creator. 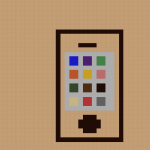 All you have to do is draw up the picture and a maze will be created for you automatically. Way cool. I had a fun time testing this game out, cool graphics, cool pictures but the one and only thing I didn’t like was the character. Im not sure why they chose a bug as your character but I would have preferred something more appealing.